On January the 23rd, in the Weekly part of the Bovespa analysis section, we made the case that Bovespa Index was close to topping out and entering a large-scale correction. At the time, we thought a sharper drop was more likely than the sideways formation it turned out to become. At least this was a decent enough call on a weekly basis, though the timing certainly not-so-precis from a Daily chart standpoint. On the analysis update issued on the 24th of February, before regular trading started, we warned that Bovespa Index was overbought. However, the signal was not the strongest, and we didn’t make a definite call that the top was in, it must be said. On the 20th of March, we issued a warning that Bovespa Index was a few percent from a strong oversold signal. This turned out to be a decent enough call, the index stopped the decline slightly lower a few days later and basically moved sideways for month from there. 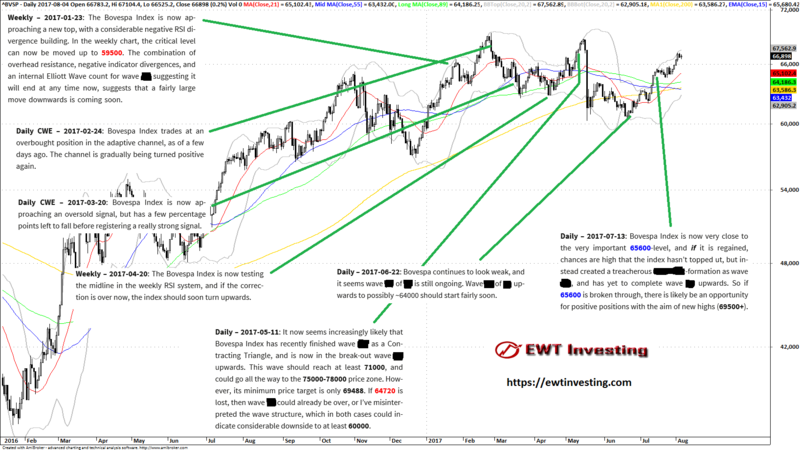 On the 20th of April, in the Weekly part of the Bovespa analysis section, we put forth that an important signal level in one of our systems had been hit, which usually correlates with rebounds and sometimes even trend reversals in the markets. As it turned out, that market the bottom before a substantial month-long rally. On the 11th of May, our wave analysis indicated that Bovespa Index should hit at least 71000. This clearly did *not* happen, as the sudden flare-up of the ongoing political crisis in Brazil, caused the market to drop violently on the 18th of May. The market topped out that cycle at 68792, which is clearly lower than our proposed minimum target of 71000. However, in that same update, we also mentioned that if a critical level at 64720 was lost, then Bovespa might swiftly fall down towards 60000, which is almost exactly what happened after the loss of the critical level. If someone bought our 20th of April call for a reversal, and used 64720 or higher as stoploss, they’d probably escape this flash crash with break-even or even a small profit. On the 22nd of June, we made the next call for the Bovespa Index, which was that an advance to approximately 64000 would commence soon, despite the index looking weak. This turned out to be correct, and the index rose to the 64000 level approximately 20 calendar days later. On the 13th of July, we put forth that an adjustment to our preferred wave count would probably be necessary, and we speculated that if a break of 65600 was to occur, that the index would continue to 69500+. As of the 4th of August, the Bovespa Index closed on 66898, and it remains to be seen if our call for 69500+ will materialize. H1 2017 turned out to be a choppy range bound affair for the Bovespa Index, in contrast to the trending nature of the Bovespa during H2 2016 (here’s the summary of our H2 2016 technical analyses of the Bovespa Index). Despite our best efforts, we didn’t fully nail the top in February 2017, even if we did at least warn in January that a large correction would soon start. The correction from February to April turned out to be fairly uneventful, but at least we got the start of the April-May rally quite closely called. We missed the top on the 16th of May – which occured lower than we had expected – and the subsequent flash crash, even though our proposed critical level and stoploss at least rescued our subscribers who used it, from more than half the flash crash. We did almost call the start of the rally in June, which is still ongoing, and now it of course remains to be seen if our proposed target of 69500+ will be hit next. Sideways, choppy markets are known to frustrate most investors, traders and analysts. We are not immune to the difficulties of a choppy market. All we can do is work hard, try to find the likeliest outcome, as well as trying to find any strong contending adverse scenarios, and present them to our readers. Interested readers can access our Bovespa analysis through our Global Elliott Wave Coverage subscription service.